Battleship New Jersey To Bring In 2015 With A Bang! FIREWORKS VIEWING, OVERNIGHT ABOARD THE SHIP AND 5-INCH GUN FIRE ARE ALL PART OF NEW YEAR’S ON THE BIG J! 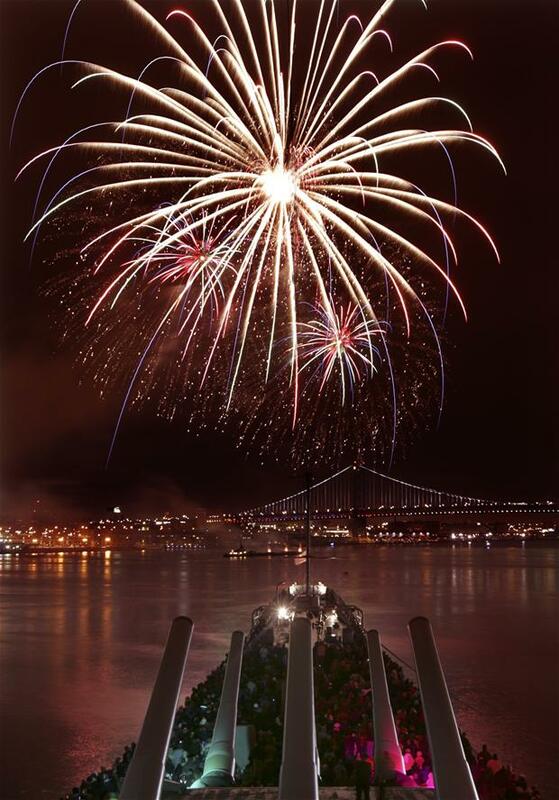 The Battleship New Jersey Museum and Memorial will once again bring in the New Year with a bang! Our nation’s largest and most decorated battleship will offer a First Night Family Overnight Encampment, Fireworks Viewing for both the 6pm and Midnight fireworks shows, and even let a guest fire the legendary portside (Philadelphia-side) 5-inch gun at midnight on Jan 1st. The Battleship will allow families to spend the First Night of 2015 aboard the ship as part of the award-winning Overnight Encampment program. Overnight guests will get to enjoy dinner and breakfast from the crew’s galley, a tour of the ship, a ride on the Flight Simulator, and the chance to sleep in the bunks that the crew of the USS New Jersey once did. PLUS, at midnight, overnight guests will get a VIP view of the fireworks over the Delaware River. The price for this special overnight is $72.00 per person. Reservations must be made in advance by calling 1-866-877-6262 ext. 203. The Battleship will have her decks open for both the 6pm and Midnight fireworks displays on New Year’s Eve. Guests can enjoy the best view of the fireworks show over the Delaware River for just a donation of $10 per person. We’ll also have music, food and bar concessions. Guests aboard the Battleship on New Year’s Eve can even take a chance to fire the portside (Philadelphia-side) five-inch gun. The ship will open at 4 pm for the 6pm show and 10pm for the midnight show. Tickets can be purchased daily from 9:30 am to 3 pm at the Battleship’s Ticket Office. Or purchase online at www.battleshipnewjersey.org. Or call 1-866-877-6262 ext. 107. The Battleship is also offering a special Tour and Fireworks combo for 6 pm fireworks show on New Year’s. Guests can enjoy a self-guided tour of the ship, departing by 3 pm, and then take their place at the forecastle of the Battleship for the 6 pm fireworks. The price is $20 for adults and $17 for children under 12. A special Tour and Fireworks combo for a family of four offers self-guided tours and fireworks for $65, and for a family of five it’s $80. Tour and Fireworks combo tickets can be purchased online at www.battleshipnewjersey.org or are available at the Battleship’s Ticket Office until 3 pm on Dec. 31. Berthed on the Camden Waterfront across the Delaware River from Center City Philadelphia, the Battleship New Jersey Museum and Memorial is a non-profit historic ship museum that offers walk-up tours Saturdays and Sundays, as well as the Holiday Week of Dec. 26 thru Dec. 31 through December. Consult the Battleship’s website for a schedule. The Battleship also offers overnight encampments for youth groups and families, special group and student tour packages and meeting/event rentals with a full catering menu. For more information on the ship’s many programs, visit www.battleshipnewjersey.org.